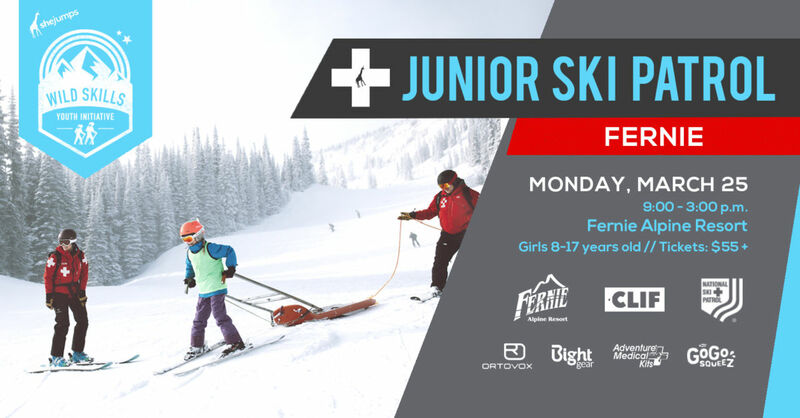 Join in the Wild Skills Junior Ski Patrol, a day camp on Monday, March 25th organized by SheJumps and Fernie Alpine Resort. Young girls will learn about mountain safety and first aid while working with the strong women on Fernie ski patrol. This SheJumps Wild Skills event is structured as a full day camp experience, parents/legal guardians drop the girls off, they are split into teams based on their skier ability and then rotate through different stations. Throughout the day girls are taught a range of outdoor skills that are utilized by ski patrollers to keep the mountain safe. Girls work alongside female patrollers and volunteers to learn more about the many facets of mountain safety and first aid. The event is open to intermediate to advanced skiers/snowboarders ages 8-17 who identify as female. On the day of the event, you’ll check in at registration beginning at 9am, get your Wild Skills Junior Ski Patrol packet and meet up with your team for the day. Teams will consist of 1 ski patroller, SheJumps volunteers and 8 girls of similar ski ability. At 9:30am we start the day with an all teams morning meeting covering ski patrol basics, weather and our agenda for the day. From there teams will break out and proceed to their various stations throughout the mountain. Stations cover topics including first aid, mountain safety, toboggan use, weather and avalanche basics & prevention. Along the way there is free skiing, surprises and games, of course! A pizza lunch is included in the day and all teams will eat together. After lunch, all teams will proceed to the buried treasure hunt and Avy Dog Demo where handlers will educate teams about the CARDA avalanche dog program and demonstrate a burial rescue situation. The afternoon will wrap up with free skiing, skills sessions and wrap up. 2:00pm Buried Treasure Hunt – use your transceiver skills to find hidden treasure! This event is for girls ages 8-17 who identify as female. Due to the nature of the event and terrain being used, this event is intended for intermediate to expert skiers & snowboarders that are confident skiing/riding off the Timber, Whitepass and Bear Chairlifts. Participants will be sent a email with questions regarding their ski/snowboard ability. $55 (including tax) which includes activities/lessons by ski patrol and volunteers, pizza lunch and lift ticket (if required).